Did the orange band on this woolly bear caterpillar predict our winter weather? Probably not, but the amazing woolly bear caterpillar freezes and thaws on the ground under dead leaves throughout the winter. It survives to become an Isabella tiger moth in the spring. This woolly bear was photographed last fall as it crawled across a trail along the shore of Mill Pond at the Headwaters Conservation Area. 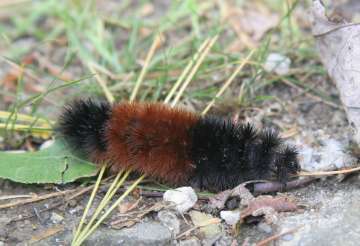 Did the woolly bear caterpillars of last fall predict the winter we're having? Most of us have seen woolly bear caterpillars, and we've also heard that you can tell how hard the coming winter will be by the width of the orange band around their middle. A narrow orange band means a hard winter, and a wide orange band means a mild winter, or so the story goes. Not surprisingly, science doesn't find much to support the tale. And yes, scientists have actually tried to test the idea that there's a relationship between the woolly bear's colors and the severity of the upcoming winter. They've collected lots of woolly bears in the fall, measured their black and orange bands, averaged these measurements, and then compared the averages with the severity of the winter that followed, year after year. The results? Inconclusive. The width of a woolly bear's orange band, it turns out, is related to the age of the individual caterpillar. As a woolly bear eats leaves and grows bigger over a few months, it molts—or sheds its old skin—several times. Each time it does so, the orange band is a little wider and the caterpillar's two black ends are a little narrower. So the wider the orange band, the older and more mature the woolly bear is. It could be, then, that a mild fall allows woolly bears to remain active longer and to become more mature, with wider orange stripes. A harsh fall or early winter would cut short the time that woolly bears are active. That means they would be younger, with a narrower orange stripe, when cold weather arrives. But does the fall weather have any relationship to the winter weather? As most New Englanders would say, sometimes, and sometimes not. What happens to those woolly bears in the winter, anyway? You're not likely to find one crawling around outside in the winter, although some may actually have been active during last week's impressive January thaw. If you look on the ground under dead leaves or poke around in an old woodpile, you just might get lucky and find one all curled up in a circle, like a hedgehog, and not moving. Is it dead? Amazingly, it's not. Woolly bears spend the winter in a kind of hibernation. Even though it's warmer under the dead and decaying leaves on the ground than it is out in the frigid winter air, woolly bears can actually freeze and thaw several times during the winter—and survive! How can woolly bears survive freezing? Unlike us, in cold weather their bodies undergo chemical changes that protect them. On one hand, they produce antifreeze chemicals, such as glycerol, that help their bodies to remain unfrozen when temperatures drop below freezing. On the other hand, they also make other chemicals that influence the way ice forms in their bodies when they do actually freeze. These chemicals help to make sure that ice crystals form slowly and remain small. Some of these chemicals also get ice crystals to form in the spaces between cells in their bodies, rather than inside cells where the ice crystals would do damage. What happens in the spring? As the weather warms and days get longer, and some plants begin to get green in late March or early April, you may again find woolly bear caterpillars on the move—but not for long. They'll feed briefly on some green grass or dandelion leaves and then spin dark-colored cocoons around themselves. After a few weeks, the caterpillar is gone and a moth emerges. It's an Isabella tiger moth (Pyrrharctia isabella). This moth is one you're likely to see fluttering at a porch light at night. It doesn't have the orange and black bands of its caterpillar stage. Instead, the moth is drab, with a wing span of 1-1/2 to 2 inches. It has small black spots on its dull yellow front wings and dull pink back wings. Isabella tiger moths live for a few weeks, mate, lay eggs, and die. Then a new generation of woolly bear caterpillars hatches and goes through its life cycle by early summer, in time for more moths to lay eggs for a second generation of caterpillars to hatch in late summer. This second batch of woolly bears will live into the fall and spend the next winter freezing and thawing under dead leaves. Woolly bears are pretty harmless caterpillars from a human point of view, although they may be disappointing as weather predictors. Woolly bear caterpillars stay low, on grasses and shrubs, so we're likely to spot them in gardens, meadows, fields, and roadsides. They feed on common plants such as dandelions, clover, plantains, and grasses. They usually don't eat our crops or ornamental plants. Like other caterpillars, woolly bears run a great risk of becoming bird food as they crawl around. Birds find caterpillars to be an excellent source of protein. The woolly bear's bristly hairs are a defense against this fate. The hairs make woolly bears difficult for birds to capture and eat. The woolly bear's color bands may also help to protect it by breaking up its silhouette, so the caterpillar is harder for birds to notice. So the amazing thing about woolly bears is not that they predict the winter weather, which, it seems, they don't do. Instead, the amazing thing is that they survive the winter. We usually think of winter weather as killing insects, and we welcome the first frost to rid us of mosquitoes. But like the woolly bears, many insects have remarkable ways of surviving winter and greeting us again in the spring.